This video introduces you to a joyful practice on a chair that combines simulated laughter with gentle yoga breathing techniques. 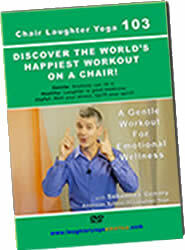 The focus of "Chair Laughter Yoga Series, Part Three: The Stress Busting Workout" is on laughter exercises that boost emotional wellness and reduce stress. People of all ages and fitness levels can practice and benefit from it. Discover The World's Happiest Workout! Laughter Yoga is a major development in the field of mood and health enhancing exercise. Laugh along to bring more oxygen to your body and brain! It will melt your stress and uplift your spirit.